Jagannath University Honors Admission Notice 2019. Jagannath University Honors 1st year and BBA 1st year Admission 2018-2019 session will be published soon. The students who are admitted into Jagannath university in honors 1st year and BBA 1st year they are invited to fill up admission form. The authority of Jagannath University will be published Honors Admission Notice. You can see the admission notice, admission test seat plan and exam result from our site. Jagannath University Honors Admission Notice. Jagannath University is one of the leading university in our country. The college was transformed into the Jagannath University in 2005. At present the University has 31 departments under 6 faculties. The faculties are Science, Arts, Business Studies, Social Science, Law and Fine Arts. Now 460 teachers are engaged in providing quality education of around 24,000 students on diversified areas. 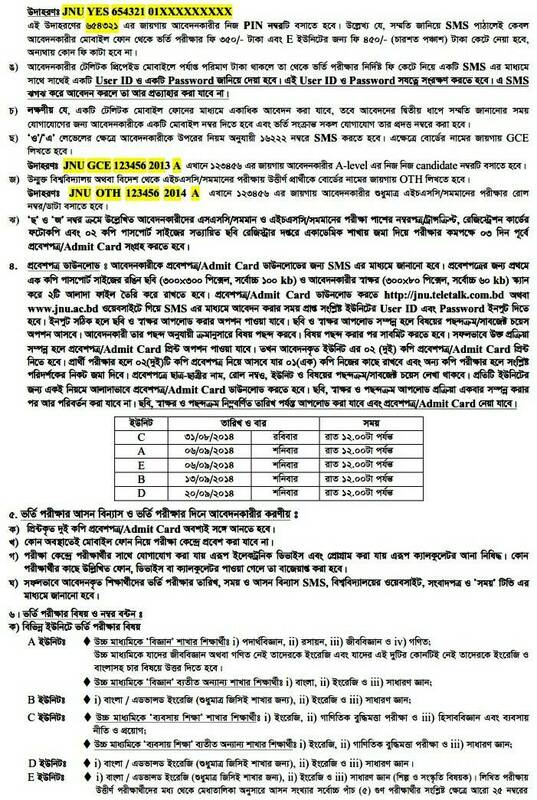 Application Qualification: Application qualification are given below in bangla image version. Please read this very carefully. After read it you can confirm your application qualification. Application Fee: 404 Taka for A,B,C & D unit. 505 Taka for E Unit. Admission Test Date & Time. See Dhaka University Admission Notice & Result. Application process for Mobile phone: The students who are apply by using mobile they are follow below instructions. You must be have a teletalk SIM for apply by mobile phone. You must be required this information when you will apply. So, read it and apply your own risk. Khulna University Admission Notice & Result. Freedom Fighter Quota for Child –FFQ. Freedom Fighter Quota for Grandchildren- FFG. Bord Name Short Keyword: Dhaka Board(DHA), Barisal Board(BAR), Comilla Board(COM), Dinajpur Board(DIN), Jessore Board(JES), Rajshahi Board(RAJ), Sylhet Board(SYL), Vocational(VOC), Diploma in Business Studies(DIB), Diploma in Commerce(DIC), Diploma in Business Management (HBM). JUST Admission Test Result & Notice. 1st SMS: JNU<space>Your Board Name Keyword<space>SSC Roll Number<space>Passing Year<space>HSC Board Name Keyword<space>HSC Roll<space>Passing Year<space>Unit Keyword and send it 16222. Example: JNU DHA 2343747 2013 DHA 4653373 2015 B. If you are a Quota candidates then follow given below instruction. After sending your 1st SMS you will get a reply by teletalk. Then you will be send second SMS. 2nd SMS: JNU<space>YES<space>PIN Number<space>Your Contact Number and send it 16222. Example: JNU YES QEWRDTA 01917263543 send 16222. Application fee: 350 Taka (For A,B,C,D Unit) and 450 Taka for E Unit. English Medium Student then use your Board name GCE. Foreigner Candidates then use your Board Name “OTH”. Here we try to included all kinds of information. You can visit their official website for more information about Jagannath University Honors Admission Notice. See Jagannath University Honors Admission Notice. RUET Honors Admission Notice & Result. You can also see your result from our site. So, you can get all information in this site. You can also see the result from our site. Here you can also see waiting list result. As a result you don’t need to visit another site. You can also see here other university admission news. Here we are also include some reputed university admission link. You can also collect your result from this link. SUST Admission Notice & Result. See Available seat in this university. Chittagong University Honors Admission Notice & Result.